I’ve just finished watching an episode of Sherlock – the new series where the characters and world of Sherlock Holmes is thrust into the 21st century. I thought it was very good, a worthy adaptation, that will hopefully bring the stories of Sir Arthur Conan Doyle to a new audience. I’m not particularly familiar with his stories, knowing only a few salient details that was picked up in this new series. Firstly, the casting in this new series is excellent. Holmes is borderline genius/neurotic, which differs to the original where Holmes was slightly more gentlemanly. Secondly, in the episode I watched, “The Great Game” his violin playing which makes a brief appearance is shockingly bad. In the original stories, Holmes was a fine amateur player, who enjoyed attending concerts of Sarasate when available. 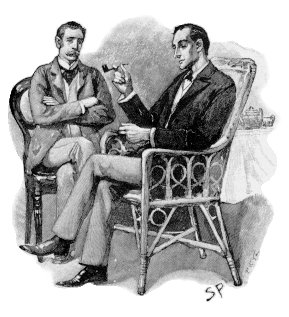 The character Watson has also undertaken an update, becoming Holmes’ blogger, a nice touch. He gets frustrated with Holmes’ lack of knowledge about basic things such as the solar system, yet is astounded about how he can connect the minutest of details. The episode finished with a confrontation with Professor Moriarty, who had a strangely Irish lilt to his accent, and I couldn’t help thinking he was a crazed yet calm Irish bomber – though that could have something to do with the episode featuring a lot of bombs. The episode finished on the mother of all cliff-hangers – guns focussed on Holmes and Watson, Holmes’ gun focussed on an explosive vest at the feet of Moriarty. And some how, I don’t think I’m ever going to find out how they all got out of there alive. I’ve got to wait until next year for the next episode, but the DVD is available next week, if it has more episodes, I might just buy it.